This photograph has been scaled down; full resolution photograph is available here (740 by 590 pixels). Navy Cross citation for Leonard H. Wagoner: The President of the United States takes pleasure in presenting the Navy Cross to Leonard H. Wagoner, Aviation Machinist's Mate First Class, U.S. Navy, for extraordinary courage and heroic conduct on 30 December 1941, as Second Pilot of a Navy Seaplane in Patrol Squadron FIFTY-ONE (VP-51), in rescuing the crew of nine men and officers of an Army B-17 that was forced down at sea four days previously. In that Leonard H. Wagoner, Aviation Machinist's Mate First Class, USN, on 30 December 1941, while acting as Second Pilot of a patrol plane at a very great distance from land, sighted two life rafts and, after the sea had been reported as too rough to attempt a rescue, did assist his patrol plane commander, Ensign F. M. Fisler, in a very rough sea, rescuing the crew, nine officers and men, of an Army B-17 forced down at sea on 26 December 1941, and did thereby exhibit rare vigilance, skill and extraordinary heroism above and beyond the normal demands of duty, the United States then being in a state of war. 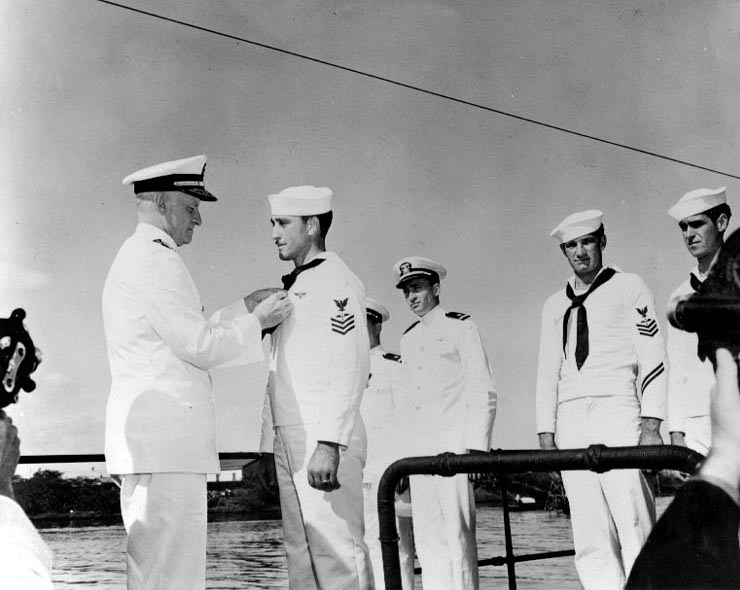 First Pilot Fisler also received the Navy Cross for this action, believed to be the first Navy Crosses awarded during the Pacific War.